November read: “This Chair Rocks” – Independence Through Connections. Ashton Applewhite is sick and tired of ageism! So she’s written a manifesto against the concept of the later part of your life being filled with “depression, diapers, and dementia.” She speaks widely on the topic, and wants to make the world more aware of how we can combat ageism, which is a huge part of what we do at SAIL! SAIL has always believed that as you get older, new doors open up for new friends, new ideas, new activities, and enjoying the finest things in life. 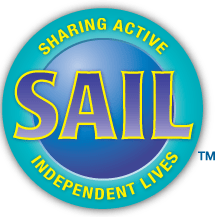 We all need help some times, so SAIL is here to provide it, but most importantly we believe in the amazing lives our senior citizens have led thus far and in helping make sure they continue to thrive! So check out “This Chair Rocks,” as well as Ashton’s blog, “Yo, is this ageist?” for some important ideas, talking points to combat ageism, and just ways to feel awesome about who you are and everything you’ve accomplished! “This Chair Rocks” is available at Amazon.com in hardcover, paperback, and e-book. The book is also available in regular and large print through Madison Public Libraries. Read Ashton’s blog “Yo, is this ageist?” here. See articles and hear interviews with Ashton here. Watch Ashton on video here. ‹ PreviousLocal performing arts events coming up in November! Next ›Staying safe during travel season! I have had the privilege of meeting Ashton before, and she is amazing. I definitely recommend reading her works and listening to her.